I’m honored to be supporting our troops through the #Sing2Salute campaign benefitting one of my favorite charities, Fisher House Foundation. This is a partnered post on behalf of Walmart and The Motherhood but as always, all opinions are my own. ‘Tis the season for giving back. I shared earlier this week 5 Ways to Give Back in Austin this Holiday Season, but today I want to share something that anyone in the country (or even world) can do to help others with #Sing2Salute. I’ve shared many times before just how near and dear the military is to my heart. My husband, dad, grandfather, and several uncles have all proudly served in the armed forces. As a former Air Force brat and later, Air Force wife I’m passionate about supporting organizations which benefit the military, veterans, and their families. One of my favorite charities I always contribute to with some year end giving is Fisher House Foundation. This amazing organization provides a home away from home for military and veterans’ families whose loved ones are in nearby military or veterans hospitals. Just think of the burden that is lifted from these families to know they have somewhere they can stay during these trying times. Which is why I was super excited to participate in the #Sing2Salute campaign! On December 1st (aka Giving Tuesday) Walmart kicked off the #Sing2Salute campaign with a $500,000 donation to Fisher House Foundation. This donation will be distributed among more than 60 U.S.-based Fisher Houses for home improvements and holiday festivities, including gifts for families and visits from Santa. I love when large corporations like Walmart give back and I couldn’t think of a better cause! Just think of all of those military families that will have a memorable and Merry Christmas that might not have had one without the help of the Fisher House Foundation and Walmart’s generous donation. But it gets better…you can help Walmart to donate even more up to $1 million to Fisher House Foundation! 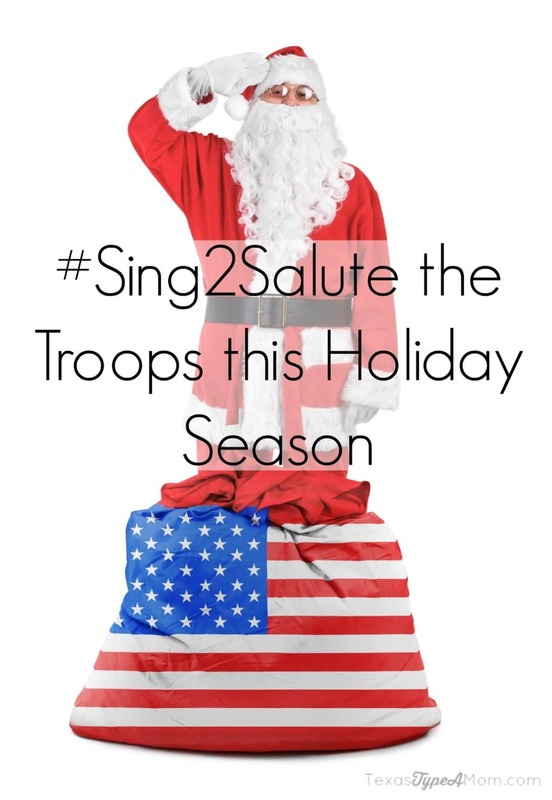 For each post published on a public Instagram, Twitter or YouTube account with the hashtag #Sing2Salute during the campaign, Walmart will donate $100. The goal is to help Fisher House Foundation fund a full year of lodging for military families staying at Fisher Houses on U.S. military bases. But Walmart’s commitment to the military, military families, and veterans doesn’t end there. This October, Walmart launched the Greenlight A Vet campaign to help create visible and actionable national support for veterans nationwide. Walmart invited all Americans to show support for veterans by changing one light bulb in their home to green, raising awareness on social media, volunteering and serving with veteran groups in their community, or starting a mentor/mentee relationship with a veteran. More information on Walmart’s Greenlight A Vet campaign is available at http://www.greenlightavet.com. In addition, Walmart is committed to hiring 250,000 veterans by the year 2020 through its Veterans Welcome Home Commitment. As part of this effort, Walmart recently greenlighted its 100,000th veteran hire. While a job is a vital piece of transitioning from military to civilian life for a veteran, it also takes a coordinated, multi-sector effort to create healthy transitions to civilian life. Walmart and the Walmart Foundation have committed $20 million in grants to organizations that provide veteran job training, education and community-based collaboration.